Machu Picchu is one of the wonders of the world and getting there, may it be by train or by trail, is not an easy feat. After a full day of viewing the awe inspiring mystic Inca citadel, what better than being welcomed into a world class boutique hotel nestled into the cloud forest. We love this boutique hotel because it offers a unique balance of local charm and authentic hospitality blended with the refined luxury one deserves after a long Machu Picchu tours. The cloud forest is a sanctuary to relax and unwind while exploring the surrounding trails, soaking in a massage experience at the UNU Spa or learning about the 372 native orchid species found here. 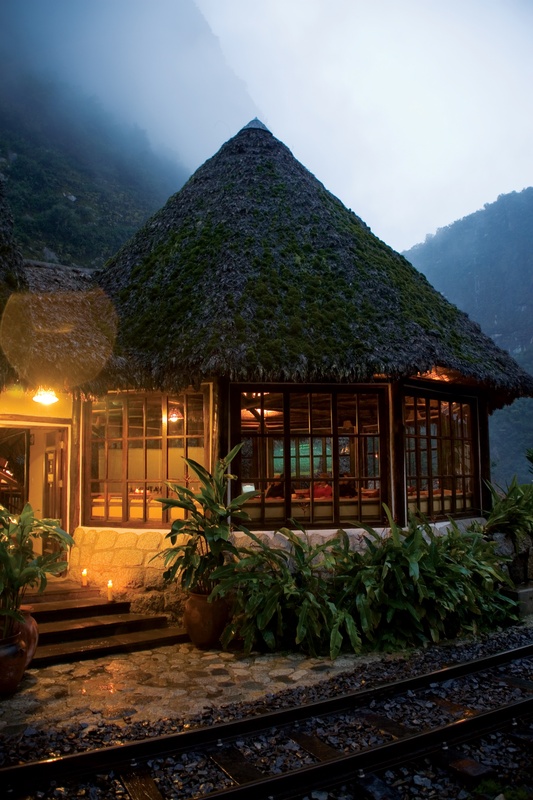 Inkaterra Machu Picchu Pueblo hotel is a village of small casitas within a 12 acre nature preserve a short distance away from the Aguas Calientes Train Station. Each room is individually appointed and offers a relaxing rustic atmosphere as the path to your room leads past creeks and small waterfalls. Ancient artifacts from the Andes are showcased throughout the bar, restaurants and reception area. The 81 casitas which are tucked into the well curated landscapes of the property offer an array of room categories ranging from a Superior Room with its local craft decor, eucalyptus beams and colonial style to the Inkaterra Villa including plunge pool and private garden entrance. Cafe Inkaterra, shown in the picture below, has stunning view overlooking the Vilcanote River and traditional palm thatched Amazonian roof offers a tranquil and intimate setting to enjoy Andean fusion cuisine in a relaxed atmosphere. Enjoy lounging here waiting for your train, or divulge in a delicious evening dinner. The grounds are a destination in their own as you can have a guided in house excursion such as the Nature Walk, Orchid Trail, Tea House visit, Bird Watching, Twilight Walks and Native Farm visit. Since Inkaterra Machu Picchu is ideally located at the base of the famous Machu Picchu Ruins, you can incorporate it into any trip to Peru. There are many ways to get to Machu Picchu including the traditional Inca Trail, via the Hiram Bingham Train or off the beaten path on a backcountry Lodge to Lodge trek leading to the backdoor of Machu Picchu. 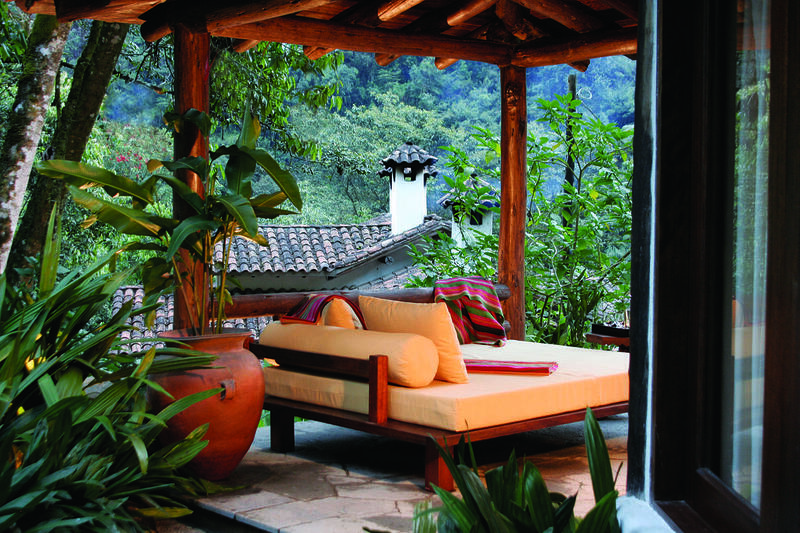 Inkaterra Machu Picchu Pueblo is just one of their award winning properties. The Inkaterra Hotels can be found in Cusco, Sacred Valley, as well as the Amazon. 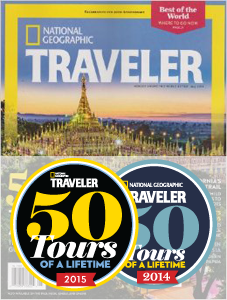 Contact one of our Peru Travel Specialists for more information. At Global Basecamps, our roots began with curating and constantly updating a list of our favorite accommodations around the globe. Not only a place to spend the night but a base camp to explore the surrounding sights, sounds, tastes and experience, a home away from home. We believe that when you travel, you should connect with the places you visit and the best place to do so is finding the perfect base camp to call home. May it be a chic boutique hotel in the city or a safari camp in the Serengeti, connecting with the local people and culture is truly a experience of a lifetime. This Spotlight Series showcases some of our favorite Base Camps from around the world allowing you to get a glimpse of what is possible. If you would like to share your favorite accommodation from around the world, let us know in the comment section below.